Fifty years ago, there was only one standard gauge preserved railway running timetabled steam services and time was running out to save any more main line steam engines for posterity. LBSCR A1X ‘Terrier’ 0-6-0T No. 32636 was one of the first locomotives purchased from BR by the Bluebell Railway. It passes under Three Arch Bridge near Horsted Keynes in January 1989. Brian Sharpe pays tribute to the steam engines purchased from BR during the 1960s to carry on steaming in the first wave of heritage railways to be opened. Many of Britain’s premier league steam engines belong to the National Collection and our heritage lines now rely largely on engines obtained from a well known Welsh scrap merchant. 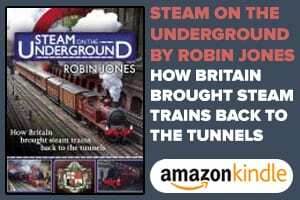 But there is an often-overlooked first division of over 100 locomotives that were purchased from British Railways 50 or more years ago and most of these were always intended for ongoing active service. This collection of engines could never have sustained the quantity and variety of heritage lines we now take for granted but nevertheless they have formed the backbone of steam preservation even after their numbers were swelled dramatically from the 1970s onwards, enabling the preservation movement to expand in the way it did. 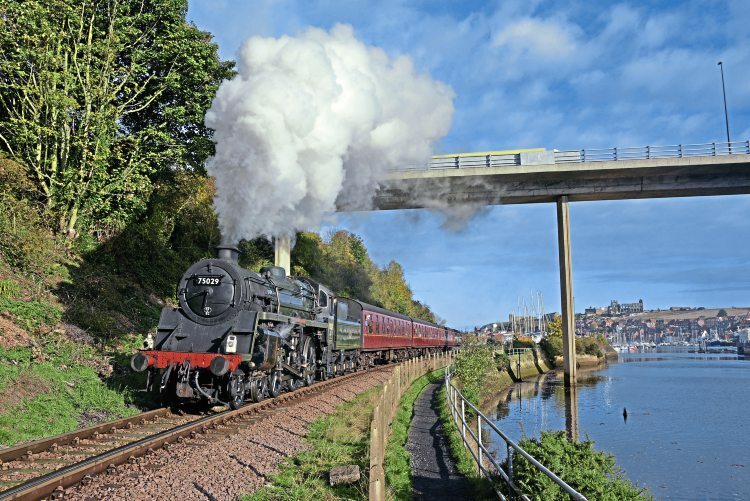 There are now 32 standard gauge heritage railways in Britain which regularly operate ex-main line steam locomotives. 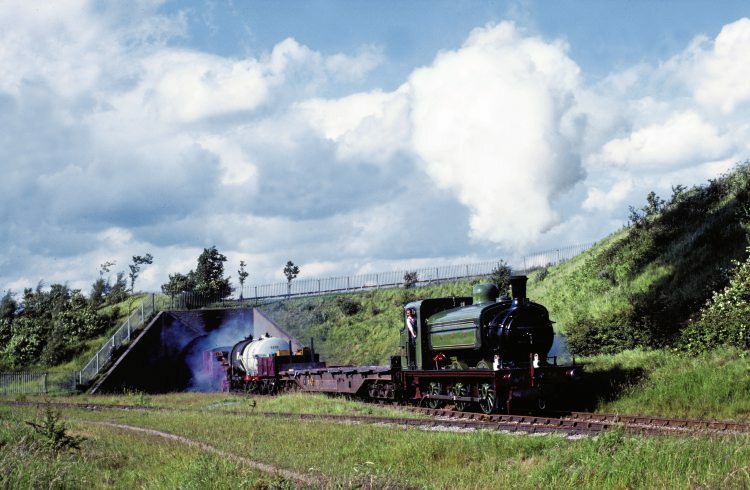 Fifty years ago, as BR steam traction was in its last 12 months, steam engines were being purchased for preservation mainly with the intention that they would be used on one of the preserved railways, all but one of which were only at the planning stage in 1967. The Bluebell Railway had been operating since 1960 but only the Keighley & Worth Valley and Dart Valley railways were close to reopening. 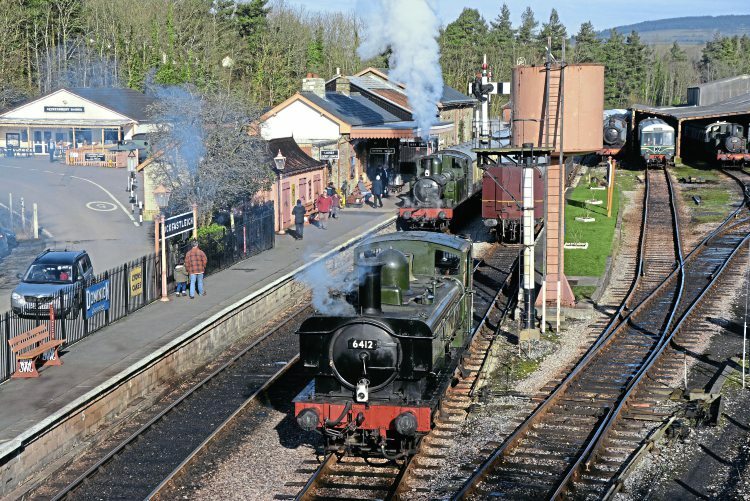 Three of the Dart Valley Railway’s original GWR steam engines purchased in the 1960s can be seen at Buckfastleigh in February 2016: 0-6-0PT No. 6412 and 0-4-2Ts Nos. 1420 and 1450. The line has now become the South Devon Railway. By the time BR steam ended and the supply of steam engines dried up, 111 main line steam engines had been saved privately, 94 of which appeared to have a prospect of an early return to steam. There were other engines of course. Apart from those in the National Collection, some privately-owned engines were bought for permanent static display and a handful were even exported overseas. All these however were expected to remain on permanent static display or overseas. Ninety-four nominally active engines would give the present-day ‘main line’ heritage railways an average of around three main line steam engines each, of which two would probably be under overhaul at any one time. Naturally there was a preponderance of small engines, partly as they were much cheaper to buy, partly as heritage lines did not really expect to need big engines. But there were also quite a number of big express engines which would certainly not be expected to be of much use on five-mile branch lines. So the heritage lines we now take for granted would realistically probably only have on average one medium-sized engine each available for use on regular passenger service at any one time. Two of the engines purchased from BR by the Great Western Society: 0-6-2T No. 6697 and 4-6-0 No. 7808 Cookham Manor on display at the Didcot Railway Centre. GWR locomotive preservation in the 1960s was led by the Dart Valley Railway whichwas closely associated with Tyseley, and the Great Western Society. The two proposed heritage lines making progress were the Dart Valley and the Severn Valley Railway, plus of course Didcot. The SVR did little about obtaining GWR engines in the 1960s although 0-6-0 No. 3205 was transferred from Buckfastleigh. The DVR company later acquired the Kingswear branch which needed rather bigger engines than the fleet which had been assembled at Buckfastleigh while David Shepherd settled on the East Somerset Railway but GWR engines did not feature in this line’s early days. 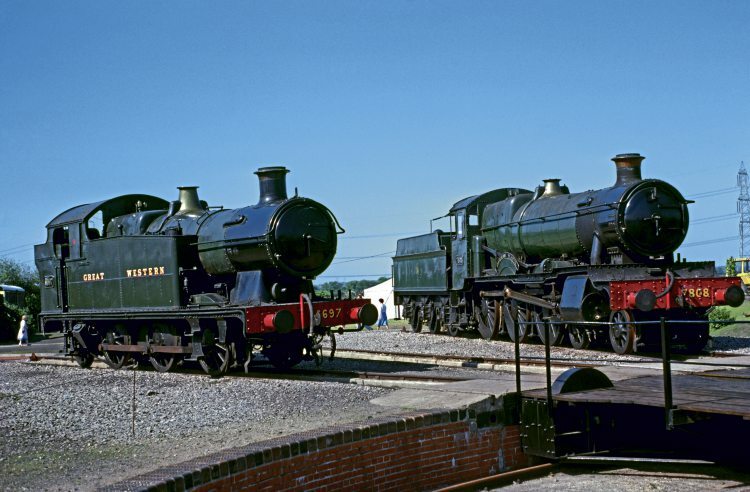 Three more major GWR lines got off the ground in the 1970s; the West Somerset, Gloucestershire Warwickshire and Llangollen railways but these would have been struggling for motive power as the supply of engines from BR had dried up ten years earlier. The Bluebell Railway had been in operation since 1960 and had a unique fleet of engines, mostly quite small ones. 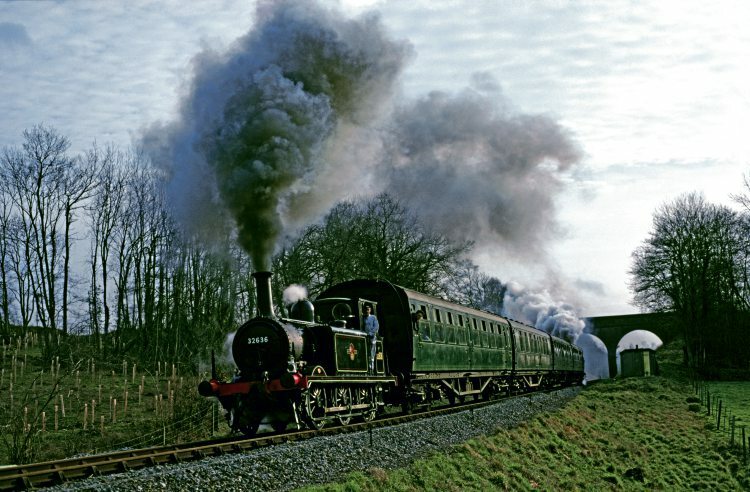 The Isle of Wight Steam Railway and the Kent & East Sussex Railway were not far behind in reopening in the early 1970s and there were also plans for the Meon Valley and Westerham Valley branch lines to be preserved. GNR 0-6-0ST No. 1247 was purchased by Captain Bill Smith in 1959 but initially saw occasional main line use before visiting a number of heritage lines in a long career in active preservation. 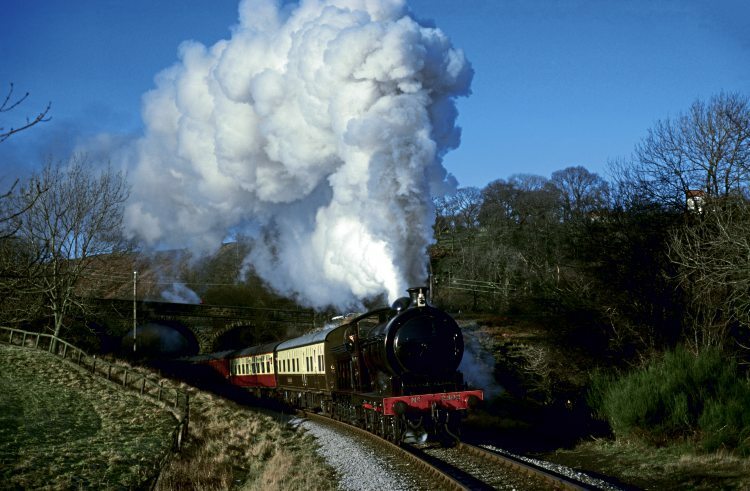 It is seen on the Middleton Railway, arguably Britain’s first standard gauge preserved steam railway, in 1990. The engine was donated to the National Collection and is now on static display. There was also a steam centre at Ashford and hopes were being pinned on the development of the Longmoor Military Railway into a major steam centre and heritage line able to operate big steam engines, but ultimately this was to fail. Ashford also closed and neither the Meon or Westerham schemes got off the ground, leading to some redistribution of Southern engines. Two more big Southern lines got started in the 1970s by which time, as on the GWR, the supply of suitable motive power was going to be problematical. The Keighley & Worth Valley Railway was to be the second standard gauge branch to reopen, in June 1968, and a collection of engines of mostly LMS pedigree had been assembled at Haworth. The situation as regards LMS steam preservation is unique in that the London Midland Region was the last region of BR to see regular steam and right at the end in 1968, no less than 10 LMS ‘Black Five’ 4-6-0s were purchased, mostly apparently destined for the Lakeside branch. SR Merchant Navy Pacific No. 35028 Clan Line was purchased from BR at the end of Southern steam in 1967 and having returned to main line service in 1974 has been in continuous main line use between overhauls since, although it has never hauled a heritage line passenger train. The 4-6-2 passes Andover with UK Railtours’ ‘Waterloo Sunset’ on July 9. It is fortunate that the Maher brothers bought an LMS Fairburn 2-6-4T each for the Lakeside & Haverthwaite Railway, as no one else bought one of these useful engines. No. 42085 emerges from Haverthwaite tunnel. Initially though, engines were concentrated at Carnforth and when the Lakeside scheme failed to materialise as expected, Carnforth continued as a steam centre in its own right and many of the 10 ‘Black Fives’ eventually found themselves in main line as opposed to heritage line use. 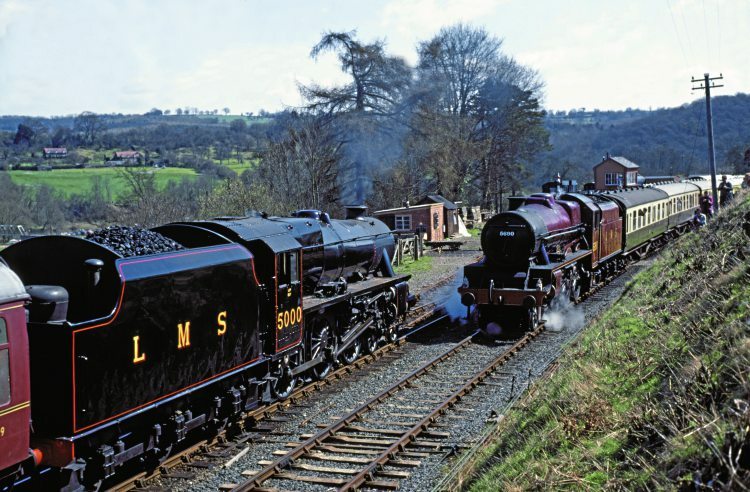 It would be ten years before any other significant heritage lines would open on former LMS routes; the biggest scheme being the East Lancashire Railway which was a very late starter in heritage railway terms. Of the others, the Nene Valley opted largely for steam engines from the Continent while what was then the Yorkshire Dales Railway stuck largely with industrial steam power. In the late 1960s, there were three proposals for heritage lines in LNER territory, two of which were quite ambitious. Neither the North Yorkshire Moors Railway nor the Great Central Railway themselves achieved anything in terms of obtaining LNER engines to operate their services though. Fortunately the North Eastern Locomotive Preservation Group was particularly successful in preserving North Eastern engines and formed a long and mutually beneficial working arrangement with the NYMR. The third proposed line, the North Norfolk Railway had originated as the Midland & Great Northern Joint Railway Society which had secured two suitable engines in the early 1960s. It is fortunate that the Maher brothers bought an LMS Fairburn 2-6-4T each for the Lakeside & Haverthwaite Railway, as no one else bought one of these useful engines. No. 42085 emerges from Haverthwaite tunnel. 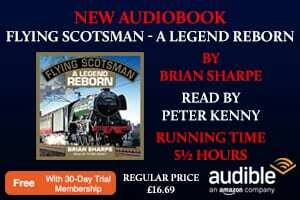 Private railway preservation in Scotland had secured a number of engines of LMS and LNER origin but it was some time before the Strathspey and Bo’ness branches were selected for reopening and engines migrated to one or other of the schemes. The Mid-Norfolk, Wensleydale and Epping Ongar lines are much more recent projects which have had to hire in main line engines on a one-off basis. A handful of BR Standard locomotives were purchased privately which would supplement the engines from the ‘Big Four’ companies. It is interesting to consider the relatively small number of engines which were purchased privately from BR but only ever intended to be cosmetically restored and put on static display. Eight of these were in the open air at Butlins holiday camps, while others were in small museums or stored for eventual museum display. 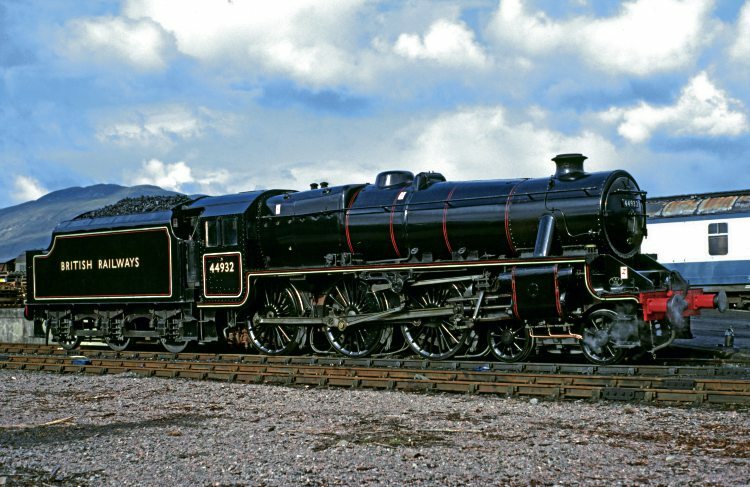 LMS ‘Black Five’ 4-6-0 44932 was one of ten class members purchased on withdrawal at the end of BR steam in August 1968 and remained based at Carnforth. Like many of the LMS 4-6-0s, it has changed owners since and has remained active but mostly on the main line, currently being part of West Coast Railways’ fleet based at Carnforth. Fortunately, all but Tiverton museum’sNo. 1442 and NBR 0-4-0ST No. 42 now at Bo’ness, have now returned to steam, but 50 years ago the thought of one of the Butlins’ engines ever returning to steam, let alone on the main line, was almost unthinkable. Two engines originally nominated for the National Collection were nevertheless sold by BR some time after 1968. NER J21 0-6-0 No. 65033 was acquired by Beamish museum and BR Standard Pacific No. 70000 Britannia was eventually purchased by the East Anglian Locomotive Preservation Society. So that was that. By the end of 1971, 111 engines had been purchased from BR; 94 looked likely to see active service, but BR had no more to sell. There were other sources of motive power though. Industrial steam lasted a little longer than on BR and industrial locomotives were found to be surprisingly useful on passenger services at 25mph. There were even a few ex-main line locomotives working in industry and of those that survived up to 1968, virtually all were saved, whatever their condition. A handful of steam locomotives were imported from overseas. These were restricted as to where they could operate because of their size, but included three WD Austerities plus some ‘gauge-friendly’ USATC S160 2-8-0s. BR Standard 4-6-0 No. 75029 was purchased from BR by David Shepherd and initially based at Longmoor in Hampshire. It moved to the East Somerset Railway but was later sold and is now a member of the NYMR’s fleet and certified to work into Whitby over Network Rail tracks. Fortunately, there was a solution to the problem of there simply being insufficient locomotives to operate the sheer number of heritage lines which were now blossoming. In September 1968, a month after the end of BR steam, the Keighley & Worth Valley Railway purchased Midland 4F 0-6-0 No. 43924 from Dai Woodham’s scrapyard in Barry, South Wales. BR had withdrawn so many steam locomotives so quickly that even with the increasing involvement of private scrap merchants it took a while to scrap them all and Dai Woodham eventually bought more than 200 of them and hardly made a start on actually cutting any up. In what now seems a very strange stipulation, private scrap merchants’ contracts with BR prevented them from reselling any of the engines they had bought other than to other scrapyards. This was aimed at preventing scrapyards from selling engines on for preservation at a profit. NER P3 0-6-0 No. 2392 climbs past Darnholm on the North Yorkshire Moors Railway. This engine was purchased by the North Eastern Locomotive Preservation Group at the end of steam in the north-east in September 1967 and is currently under overhaul in preparation for another ten years’ hard work. So there were still more than 200 engines available and individuals, societies and railways wanted them. It took a bit of negotiation but once there were no further BR engines for sale and Woodhams was virtually the only private scrapyard still in the locomotive business, BR was happy to permit the yard to resell engines. The KWVR’s 4F was not really in much worse condition than if it had been bought straight from BR and it was fairly quickly put back in steam, by which time further engines had been purchased from the yard. With an almost bottomless pit of suitable motive power to draw from, provided that Dai didn’t get round to scrapping his engines, there was now much more hope for far more heritage lines to prosper. It took a very long time though and purchases from the yard 20-30 years later were in deplorable condition and many have taken a quarter of a century to be restored to steam. Barry was not the only source of motive power as the steam preservation movement expanded. Before long, BR steam locomotives were being repatriated, and some of the engines from museums or on static display were eventually made available, including all the Butlins ones. Even engines from the National Collection were loaned to heritage lines and steam centres, with the possibility of a return to steam. These engines have made a significant contribution to heritage line passenger services now for many years. There have been others which have been steamed but only for very restricted use, such as GNR Stirling single No. 1 and MR 4-2-2 No. 673. GNR 0-6-0ST No. 1247 and LNER 4-6-2 No. 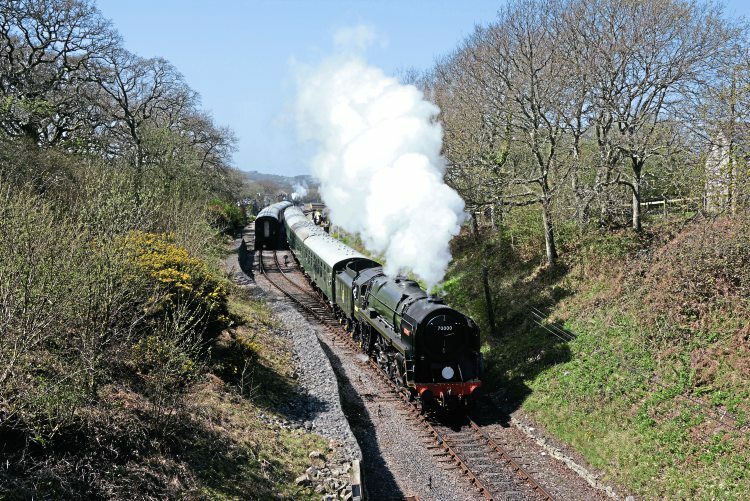 60103 Flying Scotsman which were acquired by the NRM from private owners have continued to see active service. No less than 63 ex-Barry GWR locomotives have been returned to steam and in addition to this 17 GWR engines were obtained from London Transport or industrial service, many of which have now seen active service. On the Southern, a couple of SECR P class 0-6-0Ts were purchased from industry. LSWR M7 0-4-4T No. 30053 and SR Schools 4-4-0 No. 30926 Repton were repatriated from North America and four National Collection engines of a size suitable for regular passenger service have swelled the number of engines available. The National Collection’s LMS ‘Black Five’ 4-6-0 No. 5000 passes Jubilee 4-6-0 No. 5690 Leander at Arley on the Severn Valley Railway. The SVR relied heavily on ex-Barry locomotives such as Leander but did have the services of No. 5000 for several years. Barry scrapyard has so far provided the Q class 0-6-0 No. 30541, 11 assorted 2-6-0 and 4-6-0s, and no less than 19 Bulleid Pacifics, with quite a few more to be steamed in the future. None of the LMS engines rescued after industrial service has yet made any meaningful contribution to heritage line service but 26 ex-Barry LMS engines have been returned to steam. Three useful National Collection engines have been used in passenger service and the four big Butlins express engines have been steamed, which have at times seen heritage line service. The LNER total has remained rather static though, with only a couple of NER Y7s 0-4-0Ts obtained from the NCB plus five National Collection engines returned to steam for heritage as opposed to main line service. There was only ever one LNER engine at Barry; B1 4-6-0 No. 61264, but 28 BR Standards from Barry have returned to steam. With 146 Barry engines now having returned to steam, plus 16 National Collection engines and a couple of dozen from industrial service and other sources, there have been an additional 180 engines on top of the original 94, giving a total of 270; nine for each major heritage line as opposed to the three each that were saved by the end of steam. 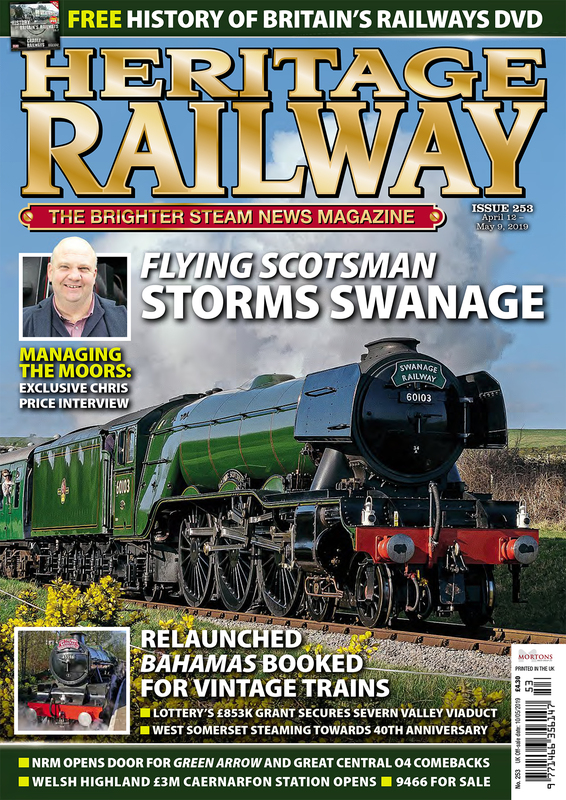 Fifty years ago, it was almost inconceivable that a steam engine could be rebuilt by enthusiasts from scrapyard condition but now there are new steam engines being built from scratch to work passenger services on heritage railways. No. 60163 Tornado will soon be followed by a GWR Grange, an LMS Patriot and an LBSCR Atlantic. But without the top 94 having been purchased from BR in the 1960s to continue to haul passenger trains, all of this might not have happened. It is a tribute to the quality of British engineering that all of the engines purchased from BR for ongoing active service have been steamed at some stage and many have spent a large proportion of the last 50 years in regular service between overhauls, despite many having been of considerable age even by the time of their withdrawal 50 or more years ago. BR Standard Pacific No. 70000 Britannia was the last standard gauge steam locomotive sold by BR for preservation. It first steamed again in 1978 and after several changes of ownership, still works on the main line and heritage lines. It departs from Harman’s Cross on the Swanage Railway in 2015. It is also a tribute to the foresight of the enthusiasts of the time who purchased these locomotives for future generations to enjoy and in many cases have continued to be involved in keeping them running. Only a few of the top 94 have now been out of steam for too many years, with little prospect of an early return to steam. Examples are GWR No. 7808 Cookham Manor, MR 0-6-0T No. 41708 and LMS 2-6-0 No. 46464, but these are very much the exception to the rule. Meanwhile, the Bluebell Railway has kept its ‘Terriers’ in steam for much of the last 50 years despite them being 90 years old when purchased; the Dart Valley which became the South Devon Railway, still has GWR 0-4-2T No. 1420 and 0-6-0PT No. 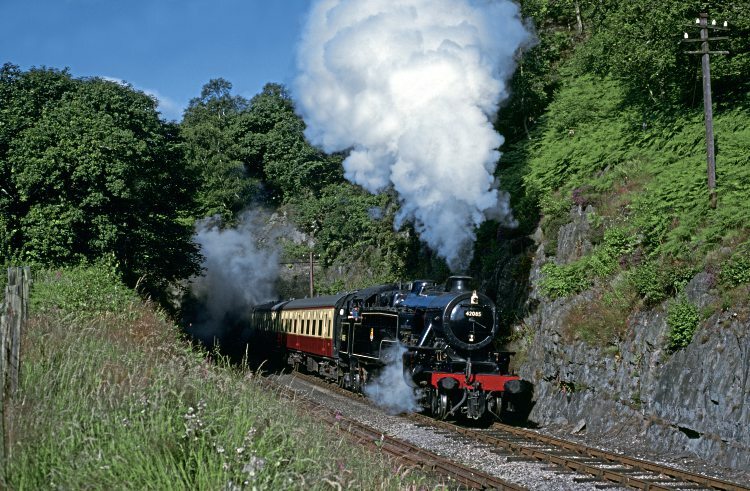 6412 on its active list; the KWVR hopes to steam Ivatt 2MTNo. 41241 for the 50th anniversary of its opening and NELPG’s two NER goods engines have kept on steaming on the North Yorkshire Moors and elsewhere. 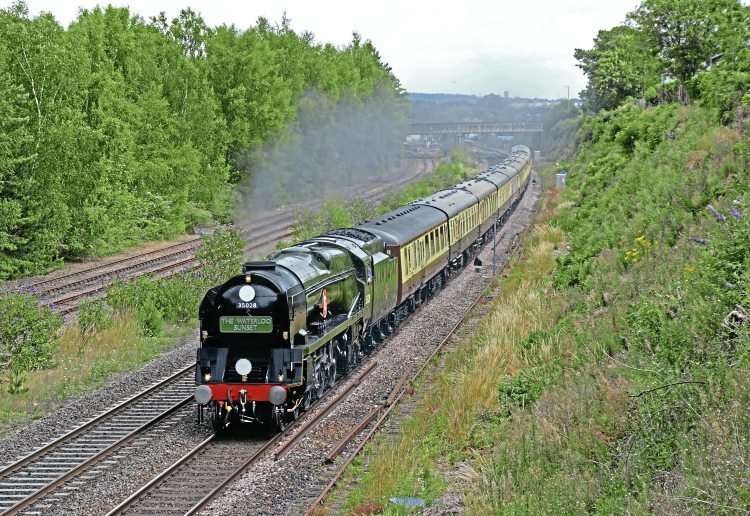 The main line should not be overlooked either, with Clan Line returning to service after yet another overhaul, to be followed shortly by Clun Castle and Sir Nigel Gresley, all purchased around 50 years ago, and of course not forgetting Flying Scotsman. 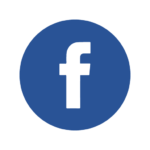 Archive enquiries to: Jane Skayman on 01507 529423 – jskayman@mortons.co.